The 40 page per minute, 11 x 17 inch printing HP Laserjet 9040 laser printer is, along with the HP Laserjet 9050, the flagship laser printing device in the popular Laserjet series. For over 25 years HP has been producing powerful and affordable Laserjet machines, but none are as fast, or versatile, as the HP Laserjet 9040/9050 units. The HP Laserjet 9040 comes in three model variations, plus the option of upgrading to the HP Laserjet 9050 models that operate ten pages per minute faster at 50 PPM. The base unit comes complete with 64 MBs of installed RAM, but the two network ready models, the HP Laserjet 9040n and HP Laserjet 9040dn, include 128 MBs to start. HP also includes not one but two open DIMM slots for memory expansion, which is highly recommended for those who often deal with complex print projects such as mixed text and imagery. With a built in processor that carries a speed of 533 MHz, its no wonder the HP Laserjet 9040 is so fast and possibly even more impressive is its maximum monthly duty cycle of 300,000 pages. With a duty cycle this high, the device is capable of printing virtually constantly and handling an entire small or medium sized office’s black and white printing demands. 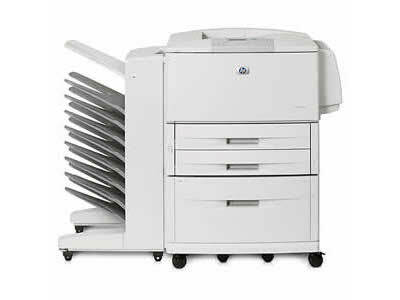 The HP Laserjet 9040 base model comes complete with two 500 sheet paper trays that can be loaded with two different types of paper for easy media switching. Interestingly, the base unit does not include the 100 sheet multipurpose tray that the network ready models do, but all models come complete with 500 sheets worth of face down output storage and 100 sheets worth of face down space. 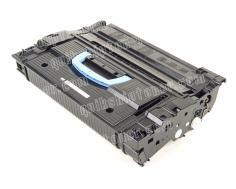 The HP Laserjet 9040dn model comes complete with a built in duplexor along with an Ethernet port. With the inclusion of duplex printing capabilities, businesses can reduce their paper usage by as much as half while also adding a unique and professional look to work loads. The few downsides to an industry level device such as the HP Laserjet 9040 include price and overall size, both of which can be very restricting for the small business. With the base model starting at 140 pounds and consecutive models weighing 153 and 168 pounds, setup and maneuvering of the unit is very difficult. HP was kind enough to provide a set of wheels for the mammoth machine, but its dimensions of 39 in. x 24 in. x 23.6 in. (W x D x H) for the base model and 55 in. x 24.9 in. x 23.6 in. for the network models makes it impossible to squeeze into small work spaces such as a home office. Review it: "HP LaserJet 9040 "
There is only one option when it comes to consumables for the HP Laserjet 9040, and it isn’t cheap. 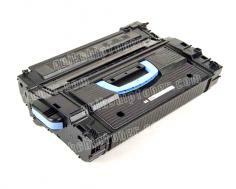 The toner cartridge available for this device carries a huge page yield of 30,000 pages at 5% coverage, which means that even under very heavy work conditions, replacement cycles will remain long, and cost per page at a minimal.